https://elpaso.bintheredumpthatusa.com/home	Bin There Dump That El Paso	https://elpaso.bintheredumpthatusa.com/img/franchisees/16.jpg	8417 Beverly Place, El Paso, TX	Contact us for more details. We are dedicated to managing and disposing of our client’s trash in El Paso in a responsible and professional manner. Are you moving in the El Paso region and need to get rid of some junk? Maybe you have a pile of rubbish around your home or office. Or maybe you have a lot of junk from your renovation project or construction clean up. Bin There Dump That provides junk and rubbish removal bins sizes 4 to 20 yards. No matter how much or how little junk or rubbish you have to get rid of, we have a bin or dumpster for you. Your local El Paso dumpster rental operator is Tony Alarcon. El Paso, Texas - El Paso, Las Cruces and the surrounding area. This business is great!! the promptness, courtesy and price was great! I called on a Friday late afternoon, and the bin was at my house at 7 AM Saturday morning!! Even the driver, at 7 AM was courteous, friendly and put the bin exactly whereI wanted it!! Excellent Service from beginning to end! I wish I could leave more than 5 stars! Amazing customer service and convenience from start to finish! I am decluttering my parents home and rented the largest dumpster. The rental time and prices are very fair and they provide awesome, friendly customer service. It was so nice to have it in my driveway long enough to allow me to work around my schedule. I like that I didn’t have to worry about hauling everything to the dump myself. I’m planning to rent again soon. Great way to get a project done without the extra hassle. Highly recommend. 10 Stars if allowed. We are in the process of demolishing our home. We needed to clear out 20+ years of junk but did not want to make multiple trips to the dump. The are very friendly, professional and extremely helpful. We would recommend them many times over. Excellent service from the start. The initial start to setup delivery to the very end when they pick up the dumpster. I would highly recommend them. I can't say enough nice things about my experience with Bin There Dump That. Big clean out projects can be stressful, but the staff here made this part of the process as pleasant as possible. Everyone from the office staff to the technicians that drop of the dumpers are helpful and extremely friendly. The worked with me when I had to extend the rental due to weather, and the technicians even swept up and left the location where the dumpster had been cleaner than how he had found it. I can't recommend them highly enough! I did a complete clean out of my mother's house and needed a 10 yarder to remove most of the stuff she was keeping at the house and some trash that needs to be thrown away. Bin There Dump That rented us a dumpster for 5 days, from Tuesday to Saturday. They brought the right size dumpster and the service was good. A big thank you to the fantastic people at Bin There Dump That in El Paso! 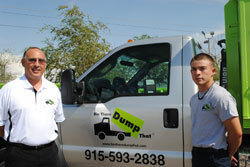 They have the cleanest dumpster rentals available anywhere with the most professional technicians ever! Thank you for making this an easy and simple process! I would recommend their service to everyone! We had some tile and wood to dispose of, as we were remodeling our home. BTDT rented out a dumpster to us for less than a week. The guy who came out was extremely polite. He came right on time, if not early, and was more than helpful; it made for a really nice transaction. I have used two other dump companies during some expansion then remodel work on our El Paso home in the past 4 years.. then recently I tried "Bin There Dump That". What a huge difference in value! They did everything as stated plus the 20 yard unit was VERY clean. Tony brought the unit to my home. He was very friendly, professional and took great care in what he was doing when placing the unit on my driveway. Silvia in their office was also very friendly and helpful. Good ol' customer service at its best! Wish we had more service companies out there who still believe in the value of Cadillac type customer service! They will certainly go far! If needed again, they will be my choice for sure.